Rostock is one of those cities where you’re faster riding a bike than anything else. If you stay in it’s inner boundaries (Innenstadt, östliche Altstadt, nördliche Altstadt, KTV, STV, Südstadt), you’ll generally reach everything within ten to fifteen minutes. Most bigger roads have bike lanes attached to them, and bycicle stands can very often be found close to places of interest. Nonetheless, you should be aware of certain conventions of cyling here (or in Germany). 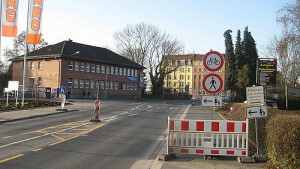 Though many people have this prejudice, Germans do cross red lights if they deem it safe (and no children can be seen). We also cross red lights with our bikes, but that is a bit more dangerous. I don’t know how it is handled if you don’t own a German passport, but if you do, and the police catches you, you’re due € 80 and unwanted points in your driving register. A friend of mine once got caught at three in the morning and though there wasn’t a care around she has been awarded this punishment. So if you’re in a hurry, still take the time to get a good look around. Obviously you’re not allowed to ride your bike in pedestrian zones (or Fußgängerzonen, as they are called in Germany). Which makes sense if there are a 1,001 tourists on the Neuer Markt, in particular if one of them is an elderly woman. But when there really is no one to be seen around, few people would waste their time walking anyway. There are two places in particular where you shouldn’t do so. Officers are quite often waiting in front of the universitie’s main building and in the passage of the Krőpeliner Straße between the Krőpeliner Tor and McDonalds. Normally, you won’t get a fine for using footpaths if there isn’t a bike lane available and there’s a bit of traffic on the road. But beware of elderly ladies! This advice doesn’t depend to any extent, whatsoever, on whether you drive carefully or recklessly. If you meet the right one, she will shout at you and scold you until you wish you had taken the bus (admittedly you should be afraid of them there too), or never been born. This point isn’t quite as central as the other ones. To me, it just feels far more natural and safer just using the opposite lane. But there are a couple of streets in Rostock which are so annoying to cross you really get tempted. One of those is the Lange Straße which is parallel to the Krőpeliner Straße. Here the chance of losing more time and money is quite big. The police even got me to picture them looming over me whenever I think about taking a shortcut there. If you want to take your bike to Warnemünde, taking the train is a very good option. You’d normally expect it to be included in your rather expensive ticket, and perhaps this excuse will work once if caught without a local sounding accent. But if you want to stay on the safe side, get a bike pass.They come in various options and you can get them at the counter or vending machine. You should keep in mind that you’re not guaranteed space on the vehicle in any case though mostly there’d be some. I tend to always get lucky with this one. When I lived in Trier, friends always told me how they had to pay fines, but though my lights were usually broken, I was only stopped once and never had to pay a thing. But here I get the impression that the police in Rostock doesn’t really care about missing illumination. Still I’d recommend having working ones. It’s really far more secure! This entry was posted in Germany&MV: Do's & Don'ts and tagged Bike, cycling, regulations. Bookmark the permalink. Is it safe to park a locked bike overnight on the road? Berlin is quite dangerous for locking a bike overnight. Just wanted to know about Rostock.